In a microwave-safe bowl, heat chocolate in 20-second intervals, stirring between, until melted and smooth. 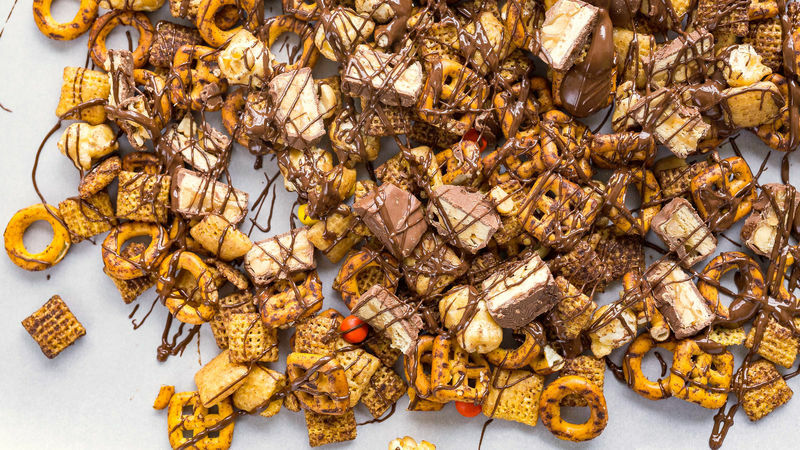 Spread Chex Mix™ on a parchment-lined baking sheet and drizzle with melted chocolate and sprinkle with candy bar pieces. Allow to cool before breaking apart any pieces and serving. When four of the five people you love most in the world love candy bars and Chex Mix™, it’s easy to know what everyone will love come snack time. So while conjuring a quick Game Day treat for the fam last Sunday, I figured a mashup was in order. I grabbed a bag of crunchy Chex Mix™ (the indulgent chocolate-caramel Turtle flavor), drizzled it with chocolate and tossed in slices of Snickers™. The result was a gourmet-looking snackable that everyone wanted to eat by the handful. And though our team didn’t win that day, I came away with MVP.